Powers/Abilities: Originally, the White Tiger was a common female Bengal tiger with all the strengths and instincts typical to the animal. After the High Evolutionary exposed her to Isotope E, she gained human-like intelligence and the ability to take on humanoid form. As a human, she had enhanced strength and agility, as well as a natural knack for the martial arts, making her an excellent unarmed combatant. The White Tiger's fingers were elongated and clawlike, durable enough to shred and slice various metals. Her senses were enhanced as well, allowing her to track and covertly stalk her prey across great distances. Her sense of smell was keen enough she could recognize quarries by their scent even if they were disguised. Despite her human intelligence and characteristics, her wild animal nature would take over when she got overly excited or angered. She was able to enter a half-tiger transitional state that turned her into an enlarged were-cat form with feline features. The White Tiger struggled with the depths and complexities of human emotion and social structure, which fed her longing to be rid of them. She wasn't human long enough to fully master the English language, which caused her speech to be slightly garbled. She spoke in semi-purring tones, strangely reminiscent of an East-Indian accent. Height: (Tiger) 8'7"; (human form) 5'10"
Weight: (Tiger) 400 lbs. ; (human form) 155 lbs. (Heroes for Hire I#12 (fb) ) - Eager to rid himself of his own, devious creation the Man-Beast, the High Evolutionary took a common female Bengal tiger from her jungle habitat. Using his evolutionary expertise, he turned her into one of his semi-humanoid New Men with the sole purpose of tracking down and killing the Man-Beast. Now known as the White Tiger, she left Wundagore's Citadel of Science and went out looking for her opponent. Through unrevealed ways, the Master of the World (Eshu) learned of her quest and decided she'd fit in his plans. He sent his lackeys the U-Foes to meet with the Tiger and to make her a proposition: if she helped him retrieve some equipment necessary for his schemes he would tell her where to find the Man-Beast. After completing her task and returning the artifact, the White Tiger learned from the Master that the Man-Beast was currently being held in the Vault. Not wanting the villain to use the piece of equipment, Tiger had rigged it to explode, taking out most of the Master's compound. (Heroes for Hire I#1 - BTS) - Eager for revenge, the Master sent the U-Foes to cause a massive break-out at the Vault before White Tiger could get to Man-Beast. The villain escaped in the crowd. (Heroes for Hire I#1) - White Tiger watched from a distance how the U-Foes orchestrated the jail break, which led her to conclude she needed back-up. Somehow aware of the existence of Power Man (Luke Cage) she traveled to New York's Gem Theatre where Cage could regularly be found. At the same time, the U-Foes and a mind-controlled Hulk (courtesy of the Controller's mind control discs) had invaded the United Nations, holding everyone in the building hostage. Instead of finding Power Man, the White Tiger spotted Luke's old partner Iron Fist and concluded he might even be better suited to her needs. She followed him around until they were both in the sewers underneath UN Plaza. Iron Fist's honed senses at last picked up on the stealthy Tiger who introduced herself. After a brief fight and equally quick explanation, they joined forces against the terrorists. Sneaking into the Plaza, they watched the U-Foes and the mind-controlled Hulk terrorize the hostages until a thoroughly drunk Hercules slammed through a wall to resolve the situation. Iron Fist and White Tiger joined the fray, while the Fist tried to reason with Hulk it was up to White Tiger to deal with the U-Foes. She started by hitting Vector in the back of the head, causing him to lash out with a blast that struck X-Ray instead. She continued to dodge his attacks, leaving Iron Fist the opportunity to strike and destroy the Hulk's control disk. Without the green goliath, the U-Foes quickly retreated. Inspired by the spontaneous collaboration, and because he felt the world needed heroes in the absence of the Avengers and the FF, Iron Fist suggested they all teamed up. Hulk laughed off the invite and departed, but both Hercules and the White Tiger accepted the offer. They went to Oracle, Inc., ran by Iron Fist's friend Jim Hammond (secretly controlled by the Master as well). (Heroes for Hire I#1 - BTS) - The Master of the World observed the formation of the Heroes for Hire at Oracle in New York. He was resolved to live up to his name and fulfill his destiny. (Heroes for Hire I#2) - White Tiger and the other Heroes for Hire were called in to deal with Nitro (Robert Hunter) who was threatening to destroy the Atlantic Coast rail yards. The fight was cut short when the inebriated Hercules decided to hurl a train wagon full of natural gas towards the explosive villain. Iron Fist and White Tiger managed to survive the resulting explosion by taking cover in a ditch. Hercules, though singed, was fine, but Nitro had escaped. Without a foe to fight, they returned to Oracle. Not too long afterwards, Nitro resurfaced again, threatening Wall Street this time. The Heroes for Hire rushed out to deal with him, with White Tiger managing to injure Nitro with her claws after Iron Fist briefly dazed him with a hit upside the head. Hercules then attacked, causing Nitro to explode. (Heroes for Hire I#2 - BTS) - Worried about the Heroes for Hire's safety against Nitro, Jim Hammond convinced newly hired Oracle, Inc. scientist Dane Whitman to aid them as the Black Knight. (Heroes for Hire I#3) - The White Tiger ducked for cover when Danny Rand pitted his iron fist against Nitro's explosive hand, resulting in a massive detonation that wrecked most of Wall Street and part of the villain's demolecularized hand. Just then, the Black Knight arrived on his flying steed Strider, declaring Iron Fist and the others under his and Avalon's protection. For some reason, hearing "Avalon" made White Tiger shiver with unease. Using his newly acquired shield of night and sword of light, the Knight channeled the full brunt of Nitro's explosive force and redirected it at the villain, thereby taking him out. A few days later, Iron Fist and White Tiger were sparring at Oracle, Inc. Iron Fist easily matched her blows and sensed she was holding back. After landing a few more hits, he asked her why. In response, she said she wouldn't want to lose control while shifting into her tiger form. Savage and ready to pounce, White Tiger was eventually calmed down by Iron Fist who talked her back into human form. Her intellect restored, the White Tiger felt thoroughly embarrassed for having shown her true nature. (Heroes for Hire I#4) - White Tiger and the other Heroes for Hire, including recent recruit Luke Cage, responded when Whiplash, Shockwave, Orka and Killer Shrike tried to take over the retired aircraft carrier Intrepid on the west side of Manhattan. After facing Whiplash in human form for a while, White Tiger shifted into her animal form which startled the villain so much she could easily be taken out with a single punch. Later, she accompanied the others to LaGuardia airport after the Heroes for Hire received an anonymous tip (sent by the Master) that the U-Foes and the Controller were planning a heist there. The heroes quickly figured out it was a trap when the U-Foes and the Controller showed up to attack them. 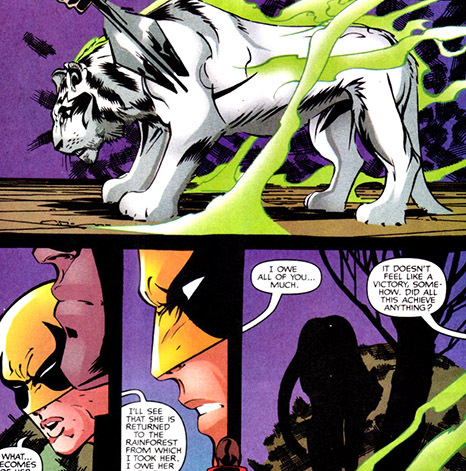 During the fight, Iron Fist was taken over by one of the Controller's discs while Vapor engaged the White Tiger, figuring she was safe from her claws in her gaseous state. However, the nimble Tiger maneuvered in such a way that Vapor got hit by one of Vector's blasts. She then dodged the U-Foes' leader and the Controller himself, bouncing off them to reach Iron Fist. Quickly slashing the control disc, she freed Danny. Figuring the tide was turning, Vector opted to teleport himself and the others away. When he activated the mechanism, the U-Foes and the Controller instead were subjected to a sudden shock that knocked them all out (courtesy of the Master who had figured he no longer needed them for his plans). (Thunderbolts I#8) - White Tiger, the Heroes for Hire and several other New York based heroes like the New Warriors, Daredevil and Spider-Man gathered to fight off the Elements of Doom who had erected a base in Central Park from which to conquer the city and destroy humanity. The heroes held their own until the Thunderbolts, who had been captured earlier and taken into the citadel, orchestrated the Elements' downfall. In the end, Tiger and the others enjoyed some downtime, catching up as only heroes can. (Heroes for Hire I#4) - Returning home to Oracle, Inc., the heroes were startled by the arrival of the injured Eternal Sersi who collapsed, but not before telling them she had come for the Black Knight's help in dealing with the Celestials. (Heroes for Hire I#5) - While Sersi was getting medical attention courtesy of Jane Foster, the White Tiger was honing her skills during another training session in which she had to fight against sophisticated combat robots. Iron Fist decided to pause the battle drill to talk with Tiger about her recent changes into her actual namesake. He assured her it was nothing to be ashamed about, he even admitted to finding it cool she could turn into a tiger. 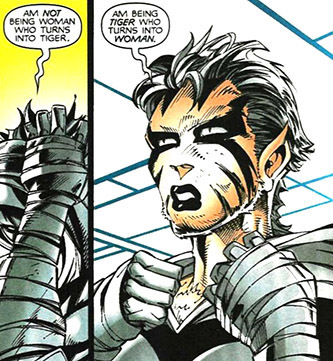 Removing her facemask to reveal her furry, non-human face the White Tiger explained to Iron Fist he had it backwards: she wasn't a woman who turned into a tiger, she was a tiger who became a woman. A little while later, she was present when a recuperated Sersi told them why she had come for their aid: the Deviant priest Ghaur had returned to Lemuria with a plan to use her and her fellow Eternal Thena and her children to help generate the Deviant equivalent of the Uni-Mind. Ghaur had sensed the imminent return of the Celestials and needed this Anti-Mind to stand up against the Space Gods. He planned to use the Anti-Mind to take over a Celestial and destroy the others with it. Sersi managed to escape to get back up and free Thena and the others. The Heroes for Hire agreed to help and, thanks to an Atlantean sea vessel, reached the underwater city of Lemuria within hours. However, as soon as Sersi teleported them in, they were spotted and overwhelmed by Ghaur and his forces. (Heroes for Hire I#6) - While Sersi and Iron Fist tried to deal with Ghaur, the White Tiger was stuck fighting Deviants including the Ghaur-controlled Karkas and Ransak the Reject. After making short work of the regular Deviant troops, even shifting into a larger, half-tiger transitional state, White Tiger faced Ransak who took her out with a blast from his staff weapon. (Heroes for Hire I#6 - BTS) - Iron Fist was the only one left standing and quickly taken away by Kro who had secretly come to oppose Ghaur. While they were planning their next move, they learned that Jim Hammond had secretly hired Ant-Man (Scott Lang) to accompany the team so he might serve as their ace in the hole. Both angry and relieved by this, Iron Fist sent Ant-Man out to free the others. Acquiring the services of a tiny, pterodacytl-like flying Deviant called Ignatz, Ant-Man took off to look for the heroes. (Heroes for Hire I#6) - Ant-Man found White Tiger and Luke Cage first. The Tiger was kept inside a water filled prison cell while Karkas guarded over them. Using his stealth and electrical stingers, Ant-Man caused the massive Deviant to accidentally break the Tiger's cell. The shock blasts also freed him from Ghuar's mind control. Now free to act, he joined Tiger, Kro and the others in a futile attempt to stop the creation of the Anti-Mind. Even though they couldn't prevent the initial formation, they did witness how Thena's children merged together to form the Dark Angel. This powerful entity was able to dissipate the Anti-Mind, forcing all the Deviants to return to their own bodies. Furious his plans had been wrecked, Ghaur ordered his forces to kill the Heroes for Hire. (Heroes for Hire I#7) - Seconds after ordering his troops to kill the heroes, Ghaur called them back because he didn't want to risk the lives of any more of his people in senseless combat. Though Kro doubted the sincerity of his words, Ghaur simply left the scene but not before demanding everyone involved to leave because upon his imminent return they would find him nowhere near as merciful. In the aftermath, the White Tiger overheard Thena and Kro discuss the fate of their two children, who as the Dark Angel seemed to possess powerful abilities others like Ghaur might try and exploit. Thena was resolved to find a refuge for them, leading the White Tiger to suggest she took them to Wundagore, where they'd be safe and of great interest to the High Evolutionary. She followed that up by revealing to her stunned teammates she was, in fact, one of his creations. Dodging Iron Fist's demands for a full explanation, White Tiger promised she might do that after she'd brought Thena and her children to Wundagore. Thena agreed to take her offspring to see the High Evolutionary and decreed the White Tiger could serve as their guide. (Heroes for Hire I#8) - When White Tiger, Thena and her children reached the Citadel of Science, they were stunned to find it in ruins (as a result of recent assault by the Acolytes). They soon found themselves under attack by some of the Acolytes but before the Tiger could respond she and the others were taken out by a mental assault courtesy of Exodus. The Acolytes' leader was eager to find out if the Tiger knew anything about Isotope E and was determined to "peel her mind like a grape" to get what he wanted to know. (Heroes for Hire I#9) - White Tiger, Thena and the children woke up in chains in the Acolytes' base. After a while, Exodus arrived to psionically question the White Tiger about whatever she might know about her creator and his evolution enhancing Isotope E. Hearing the Tiger's screams infuriated the already outraged Thena who used her Eternal might to break her bonds. After freeing the Tiger, who immediately attacked the Acolytes, Thena took on Exodus. Seemingly unwilling to extend the fight, but claiming he had all the information he needed from the Tiger anyway, Exodus allowed Thena and the others to leave Wundagore unopposed. (Heroes for Hire I#11 - BTS) - White Tiger contacted Oracle, Inc. to arrange transportation out of Transia back to the United States for herself and the others. Jim Hammond sent a transport ship to pick them up. 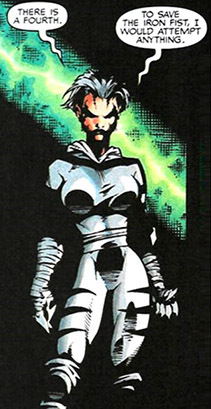 (Heroes for Hire I#11) - White Tiger returned to Oracle just as most of the Heroes for Hire had been captured in Symkaria following a mission. The White Tiger was especially concerned about the fate of Iron Fist, while Hammond went to work on a way to send a rescue team. (Heroes for Hire I#12 - BTS) - Eventually, Iron Fist and the others returned from Symkaria but not with Luke Cage who was revealed to be working for the Master of the World and got teleported away by the villain. The Master's next move was to capture and lift the flying Hydra Island from the ocean floor to use as his new base of operations, planning to unleash the lethal Compound Omega, a death spore capable of ridding the planet of what he considered the "excess human population". He was aided by Cage and clones of Heroes for Hire he called Strike Force One, grown from DNA samples he obtained from Jim Hammond, whose android mind he was secretly controlling as well. (Heroes for Hire I#12) - Hammond explained the current situation to the White Tiger and the other Heroes for Hire, including Hercules, the newly joined She-Hulk and Thena who had offered her aid as well. They then set out to oppose the Master and Luke, heading for Hydra Island aboard two Oracle aircrafts. The Tiger explicitly opted to share a vessel with Iron Fist. On the way there, she rather awkwardly revealed she had actually dealt with the Master before, recounting how she'd tricked him which had led to the U-Foes destroying the Vault. Hammond was furious with her, but the naively innocent White Tiger honestly had not considered the Master might have survived the destruction of his lair. Before they could discuss the matter further, the Master hit their aircraft with an EMP, causing them to crash. The Tiger and Iron Fist used their agility to land safely on Hydra Island and were quickly joined by the others. 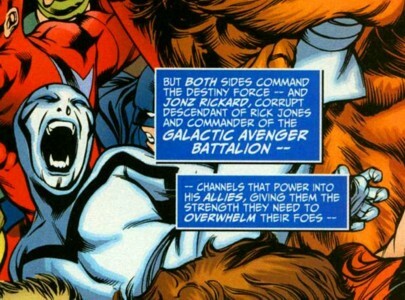 The Master then appeared with Strikeforce One, sending the evil clones against the team. White Tiger fought her counterpart She-Cat while the Heroes for Hire dealt with the Master, thanks in part to Luke Cage risking his life by turning against the villain at the last possible moment. Following his defeat, the high flying Hydra Island began to self-destruct forcing the Heroes for Hire to head for the escape pods. Iron Fist brought the injured Luke Cage along. On the way down, he used the healing powers of his chi to mend Cage's injuries, restoring his old friend to health while falling into a coma himself. (Heroes for Hire I#13) - Sharing an escape pod with Thena, the White Tiger safely reached Earth. Bursting out of their pods, the Heroes for Hire were shocked when the one containing Power Man and Iron Fist remained still. She-Hulk and Hercules ripped open the pod to find Cage holding the seemingly lifeless Iron Fist. The sight caused the White Tiger to shriek out in terror. 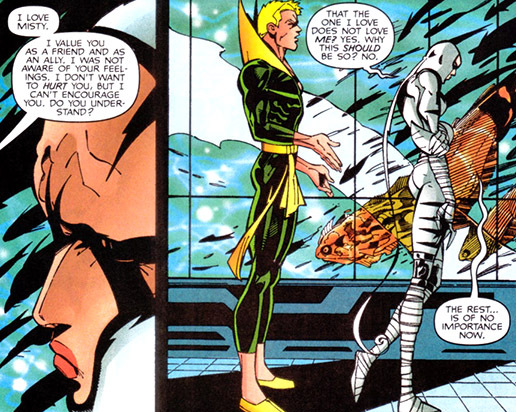 Once the team got back to Oracle Inc. and Iron Fist was hooked up to life support equipment, the White Tiger lashed out at Cage, blaming him for Danny's current condition. She stormed off, swearing she would see him dead should Iron Fist die. A little while later, she returned to participate in a mystical ritual led by Brother Voodoo who intended to siphon off some of the life force of Danny's friends Misty Knight, Colleen Wing and Luke Cage to help restore him to health. Voodoo was relieved the Tiger offered, claiming her strong animal vitality would be an excellent addition. Misty and the Tiger shot looks of contempt at each other before the ritual started. The White Tiger's feelings were deeply hurt when Danny came to and immediately called for Misty. She walked off, feeling dejected. (Sensational Spider-Man I#28) - The White Tiger kept quiet while watching a news report on New York's latest hero the Hornet with her Heroes for Hire teammates Power Man and Iron Fist. Luke Cage commented on the recent appearance of several new heroes (actually all Spider-Man in different secret identities), fearing the fact they worked for free might put the Heroes for Hire out of business. (Heroes for Hire I#14) - White Tiger surprised Misty Knight when she was working alone at her Nightwing Restorations offices. Coming in through the window, she challenged Knight to a duel: whoever won, had the right to love Iron Fist. The loser either forgot about him or would be dead. Before it could come to blows, Misty managed to talk some sense into the Tiger: even if she killed Misty, there was no assurance that would make Danny love her. 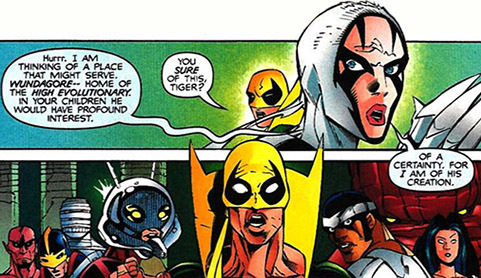 Confused, White Tiger agreed to Misty's proposition: Knight would willingly step aside if Iron Fist had feelings for the White Tiger and suggested she asked her teammate. Sympathizing with the fact the Tiger had trouble dealing with all these unwanted human emotions, Misty watched the confused mutated feline depart. (Heroes for Hire I#15) - White Tiger was contacted by Bova, who asked her on behalf of the High Evolutionary to visit the Haven, the New Men's temporary home in upstate New York. When she did, the Tiger finally learned how Exodus and the Acolytes had taken over Wundagore Mountain: the High Evolutionary's continued experiments had destabilized his genetic make-up, causing him to go from godlike to a devolved subhuman state often within moments. It was during one of these bouts that the Acolytes forced the Knights of Wundagore to retreat. Bova took the Tiger inside to meet with the other Knights who were initially suspicious of her. That all changed when the High Evolutionary himself showed up, vouching for her by asking about her progress in finding the Man-Beast. He was also displeased by the reports of her exploits as a member of Heroes for Hire, but Tiger cleverly pointed out they might be worthy allies in helping them retake Wundagore. Intrigued, the H.E. told her to go and gather the Heroes for Hire. Watching her go, the Knight called Lord Anon (secretly the Man-Beast) thought to himself the Tiger needed careful watching. The Tiger came back to Oracle, infuriating Hammond when he heard that she'd committed their services to the H.E. when they had so many actual paying clients. Iron Fist stood up for the Tiger and assured her they would aid her. They then had a heart to heart about the Tiger's romantic feelings for him, with Danny explaining he only valued her as a friend. Asking her if she understood this, Tiger replied that she knew the one she loved didn't love her. But not why this should be so. The Heroes for Hire traveled to the Haven where they encountered the Knights again, who made no secret they didn't think much of them. Lord Anon, unprepared for the Tiger's return and not disguising his scent, was instantly recognized by her as the Man-Beast. Before she could reveal the truth, he struck her with his sword which left her gravely injured. This caused the Heroes for Hire to attack the other Knights, but their fight was cut short by the High Evolutionary who used his newly constructed Isotope E lance to devolve the H4H into primates. The H.E. and his Knights then left them behind to go free Wundagore, ignoring Bova's pleas that the White Tiger needed help. H.E. called her a traitor and the heroes her tools. (Quicksilver I#11) - Some time after the H.E. and the Knights of Wundagore had departed to reclaim their home, the team's former leader Quicksilver returned to the Haven. He was stunned to find White Tiger, slowly bleeding to death on the floor, surrounded by her primate-like teammates. He rapidly returned White Tiger to Oracle for medical attention, discussing with Jim Hammond what to do next while Jane Foster tended to the Tiger's injuries. Not sure how to interpret the Tiger's delirious warnings about a traitor, Quicksilver decided to return to Haven to try and find out where H.E. and his Knights had gone. Hammond told him he was sending She-Hulk and Thena along. (Quicksilver I#11 - BTS) - Before Thena and She-Hulk could get to Haven, Quicksilver was there to find the Acolytes had just teleported in. He fought them single-handedly until the Isotope E's effects briefly wore off and the Heroes for Hire were restored to normal. The Acolytes retreated while Quicksilver accompanied the H4H back to Oracle, Inc. At the same time, the H.E. was seemingly stabbed to death by "Lord Anon" who revealed himself as the Man-Beast and took the Isotope E from him. (Heroes for Hire I#16) - The Iron Fist used his healing chi to restore the injured White Tiger back to health. She told him and the others that "Lord Anon" was actually the Man-Beast and that she was specifically created to destroy him. Their talk was briefly interrupted by Ant-Man who suffered a sudden, violent devolution. This convinced everyone that they needed to go to Wundagore to get the H.E. to fix them with Isotope E.
(Heroes for Hire I#16 - BTS) - While the H4H headed for Transia, the Knights of Wundagore discovered the Man-Beast's deceit. Their brawl was interrupted by the arrival of the Acolytes who immediately attacked. 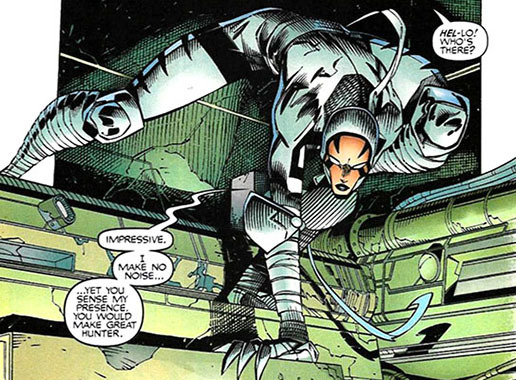 (Heroes for Hire I#16) - In Transian airspace, the White Tiger and Quicksilver helped determine that the H.E. 's most likely location would be the armory, where they'd be to arm themselves. The H4H decided to head there. When they arrived, they were unpleasantly surprised when Exodus and the Man-Beast had decided to join forces against them. Of course the heroes attacked, but when most of them started to devolve midway through the battle, the Knights and Acolytes made short work of them. With only Cage left standing, the Man-Beast finished him off using an Isotope E to take him out and also return him to his human form. 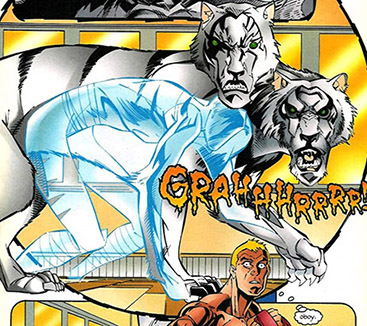 (Quicksilver I#12) - Quicksilver was kept in a separate location in the Citadel as Tiger and the H4H. Thanks to Amelia Voght (guided by Magneto) he was able to escape, capture the Isotope E scepter and free the Heroes for Hire. However, the White Tiger refused to cooperate with his plans, demanding to fulfill the purpose of her creation: find and kill the Man-Beast. She caught up with the sadistic villain just as he'd mentally forced Lady Ursula to shoot herself through the head as a demonstration to the other Knights they'd better surrender the H.E. to him. White Tiger immediately attacked Man-Beast and tore into him. The Knights wanted to help her, but the H.E. ordered them not to intervene: the White Tiger was bred with defenses against the Man-Beast's powers none of them had. The two combatants prepared for a fight to the death. (Heroes for Hire/Quicksilver Annual 1998#1) - The battle between White Tiger and Man-Beast was briefly interrupted by a terrible explosion, a result of a final confrontation between H4H, the Knights of Wundagore, Quicksilver, Exodus and his Acolytes and a hyper-evolved High Evolutionary. Man-Beast momentarily thought himself safe and already planned to retake the Isotope E scepter, unaware the Tiger was stalking him. Man-Beast involved himself in the fight, even offering his telepathic prowess to help Thena and the Wundagore Knight Delphis in returning the H.E. to normal using Isotope E. While they were in unison and getting ready to act, Iron Fist spotted White Tiger who was about to give into her instincts and attack, thereby disrupting the one chance they had to end the fight. Unable to fight the one she loved, White Tiger made a half-hearted attempt. In the end, with the H.E. restored to his normal, godlike state he used the scepter to devolve Man-Beast. Her purpose for being now resolved, the White Tiger stunned everyone when the High Evolutionary asked what good he could do for her and she requested to be made again as he first found her. Confused, the Evolutionary wondered what prompted this request, he was even willing to turn her fully human. With tears in her eyes, White Tiger begged him not to: she would never be able to master all the terrible pains, sorrows, longings and other feelings being human entailed. In a final plea, she told her lord that if he loved her, he'd release her. The H.E. complied, using the scepter to return White Tiger to her original white Bengal tiger form. She wandered away, with the H.E. assuring her former teammates he would see to it she was returned to the rainforest she hailed from because he felt he owed her at least that much. Sigh..White Tiger, the Norvo will always have a soft spot for you. 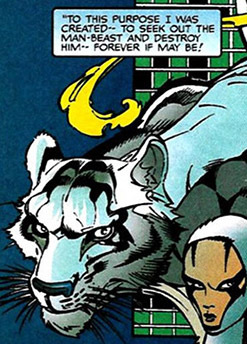 White Tiger received a profile in Marvel Legacy: The 1990s Handbook#1 and the Official Handbook of the Marvel Universe A-Z#13. (Avengers Forever#12) - An evil, alternate reality version of the White Tiger was part of an army of Avengers summoned by the Time Keepers via the Forever Crystal to help defend them during the Keepers' final confrontation against Kang the Conqueror, the Supreme Intelligence, Rick Jones and their Destiny Force gathered assemblage of alternate, time-tossed Avengers. During the fight, the White Tiger was hurt by an equally alternate Sasquatch who broke one of her legs.